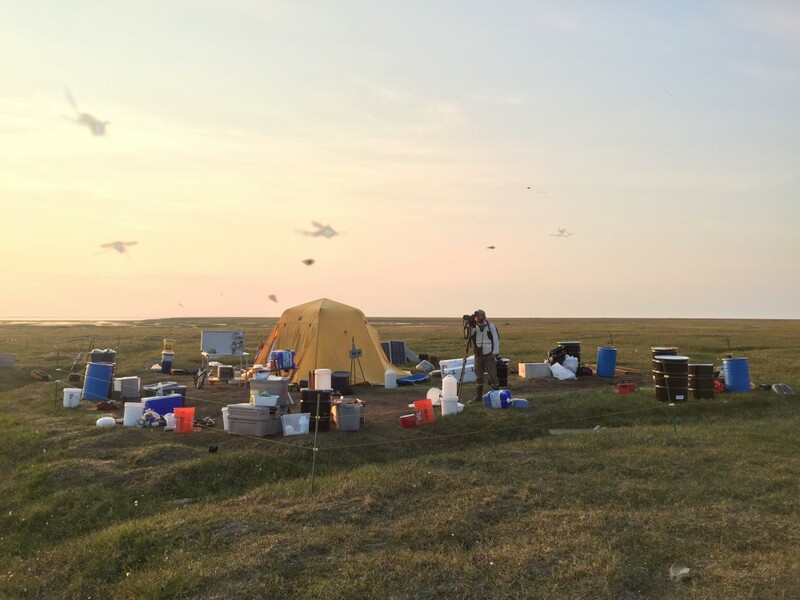 Our team included Dr. David Mizrahi of New Jersey Audubon, John Herbert of Tulane University, Bracken Brown, a Pennsylvania ornithologist and teacher, Onofre Montiero of Aquasis in Brazil, and Alan Kneidel, Staff Biologist at Manomet. We were also joined by Dr. Carlos David Santos, Professor at the Federal University of Pará. 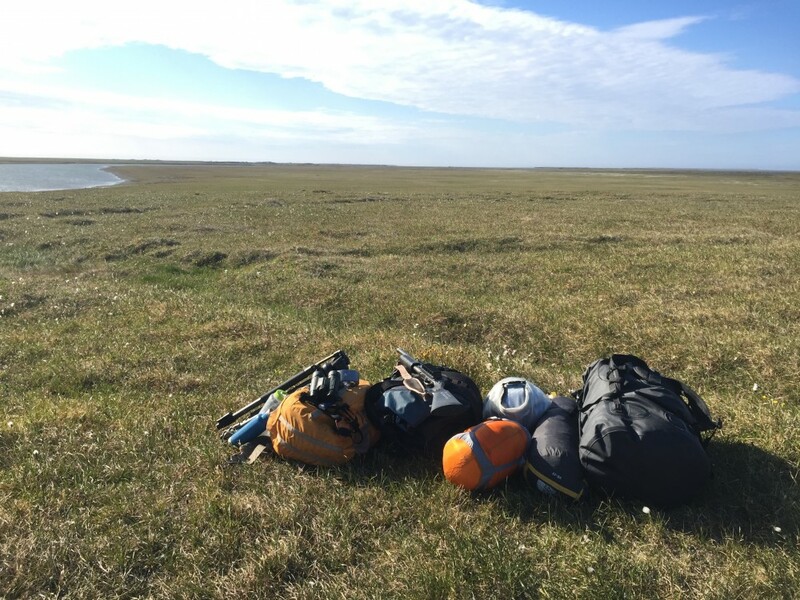 The photos and captions below, taken and composed by Alan, are meant to share the team’s experience. Located south of the mouth of the Amazon River, the Brazilian state of Pará is a tropical, biodiverse region. This satellite image gives an idea of what the coastline looks like there. 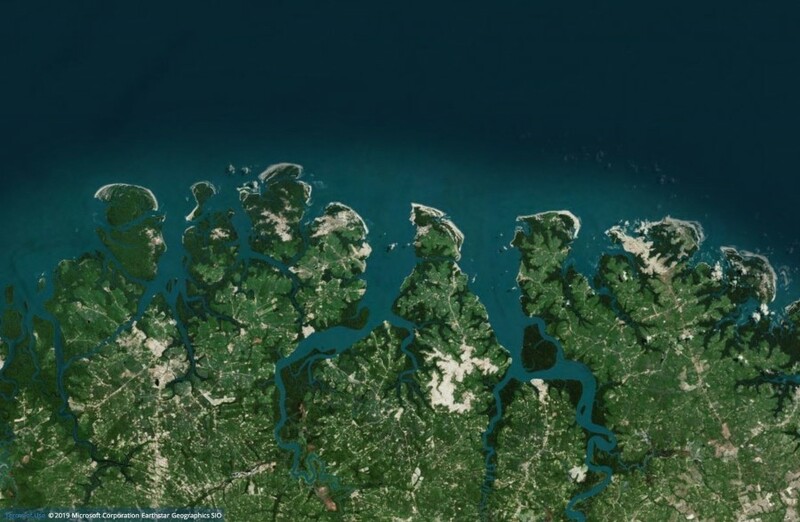 While many parts of the interior have been deforested, the sinuous, mangrove-bordered coastline is comparatively remote. 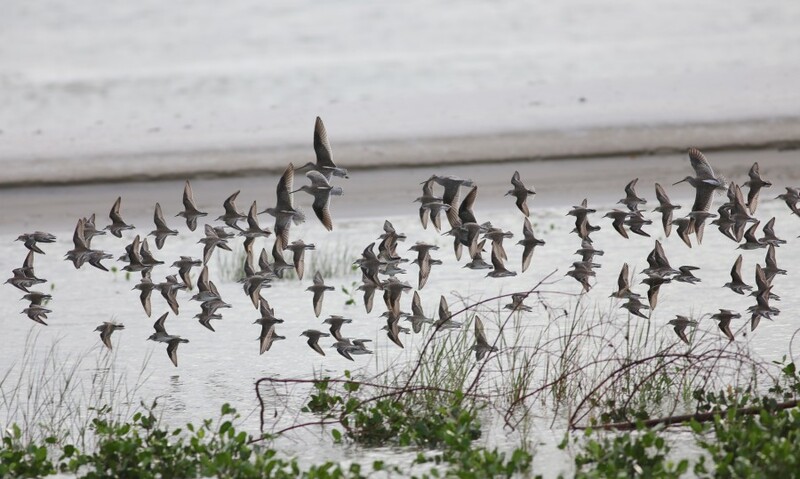 This region extends into the neighboring state of Maranhão and the area known as Reentrâncias Maranhenses, a WHSRN site of hemispheric importance for Nearctic shorebirds. 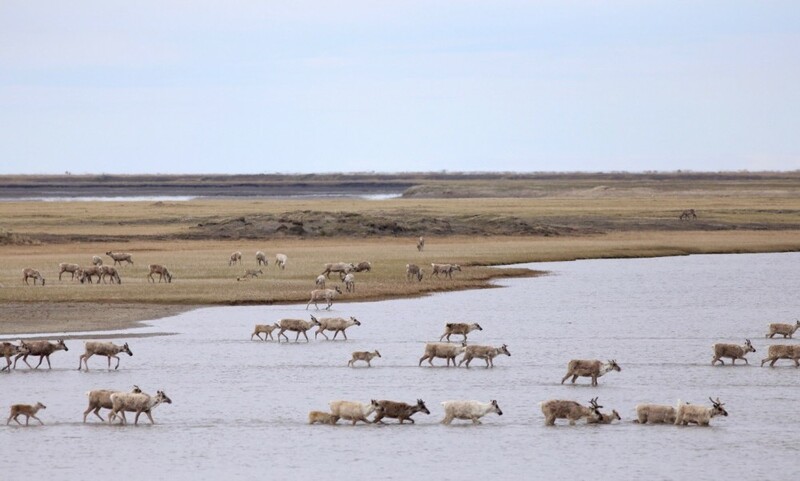 While hosting many species, this habitat is of particular importance to populations of Black-bellied Plover (Pluvialis squatarola), Ruddy Turnstone (Arenaria interpres), Eastern Willet (Tringa semipalmata semipalmata), Whimbrel (Numenius phaeopus), Red Knot (Calidris canutus rufa), and Semipalmated Sandpiper (Calidris pusilla). 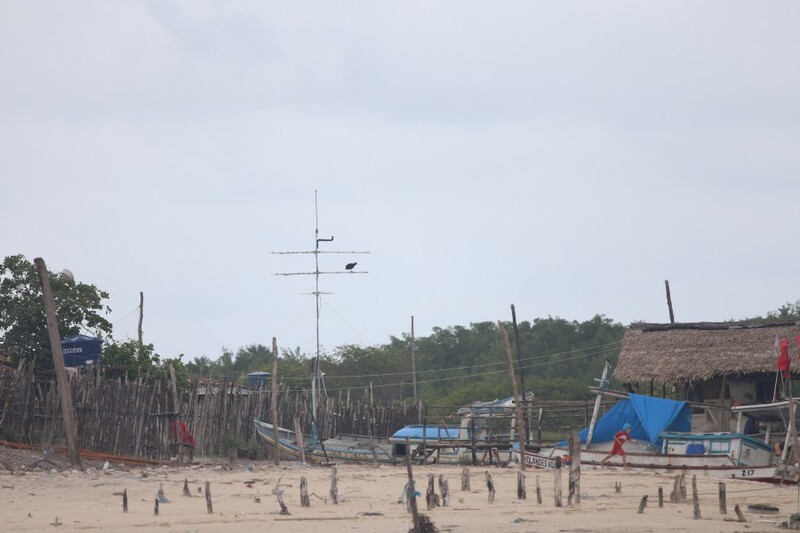 Access is difficult, and the isolated communities rely on boats for transportation. The boats themselves come in a flamboyant array of colors and designs. 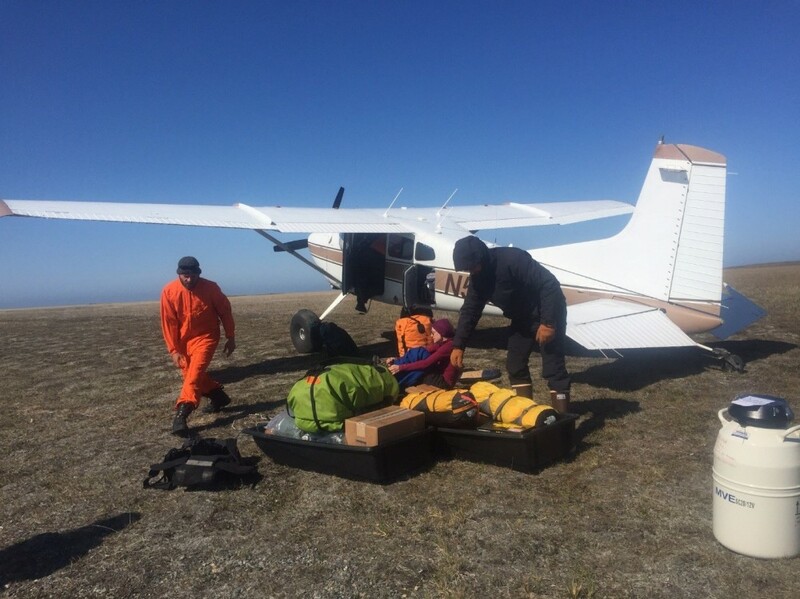 The assistance of the locals was invaluable, both for logistics and for their insight into local shorebird behavior. 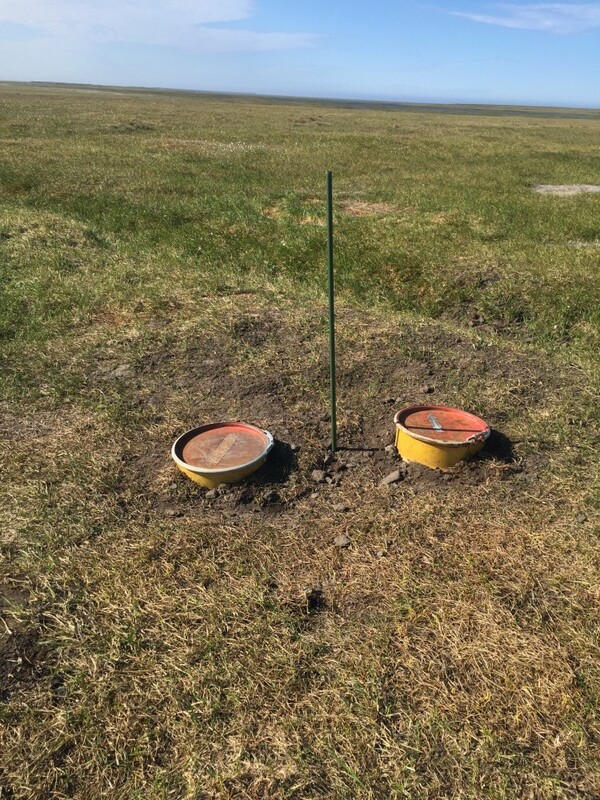 We successfully deployed over 70 nano-tags on Semipalmated Sandpipers (Calidris pusilla). 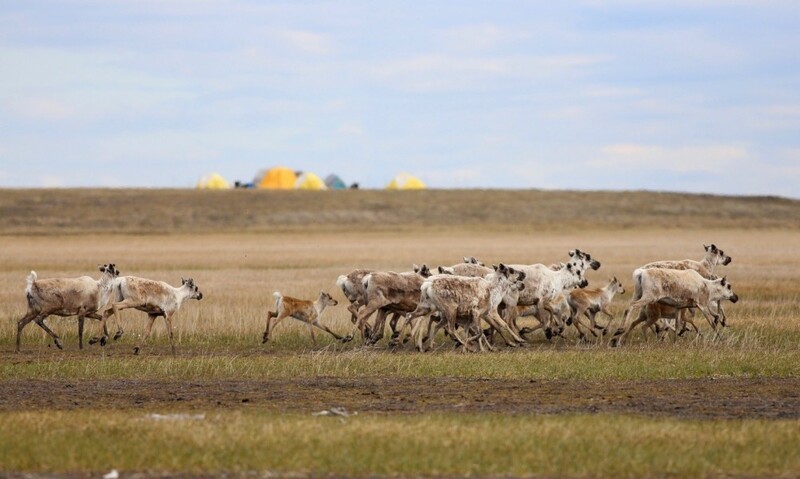 Nano-tag technology allows for up to 2,000 tags to be assigned to a single radio frequency while retaining the ability to identify individual animals. Transmitters are picked up through a network of widely-spaced towers that have been constructed along the coastline. The towers take a solid two days of work to erect. Here, one of the two towers we built is adopted as a favorite perch by a Black Vulture (Coragyps atratus). 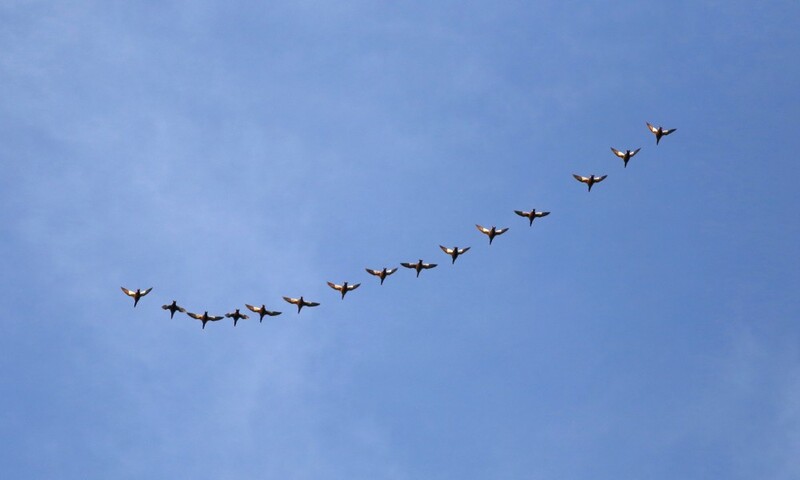 The team processes birds in our mobile field station on the Ilha de Maracá in the state of Amapá. 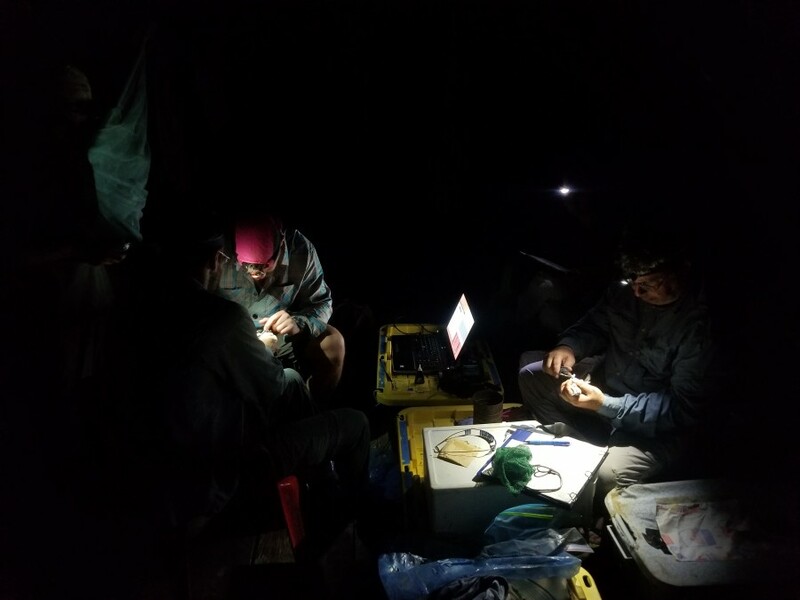 At this site, our trapping efforts centered on a mangrove high-tide roost, often forcing us to work through the night. 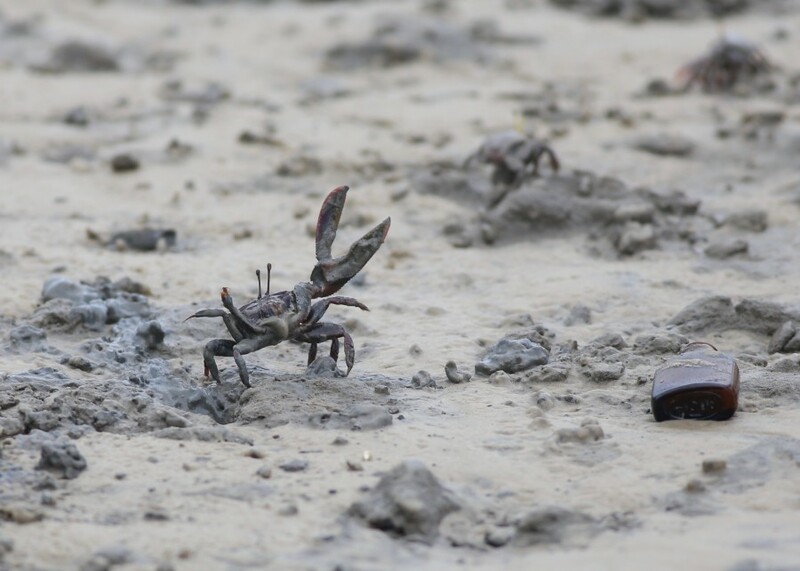 Fiddler crabs (Uca sp.) are widespread in mangroves and saltmarshes throughout the world. Wherever they are found, they serve as a principal food source for a variety of coastal waterbirds. In Brazil, Whimbrel (Numenius phaeopus) and Scarlet Ibis (Eudocimus ruber) use their long, curved bills to extract crabs from their burrows. 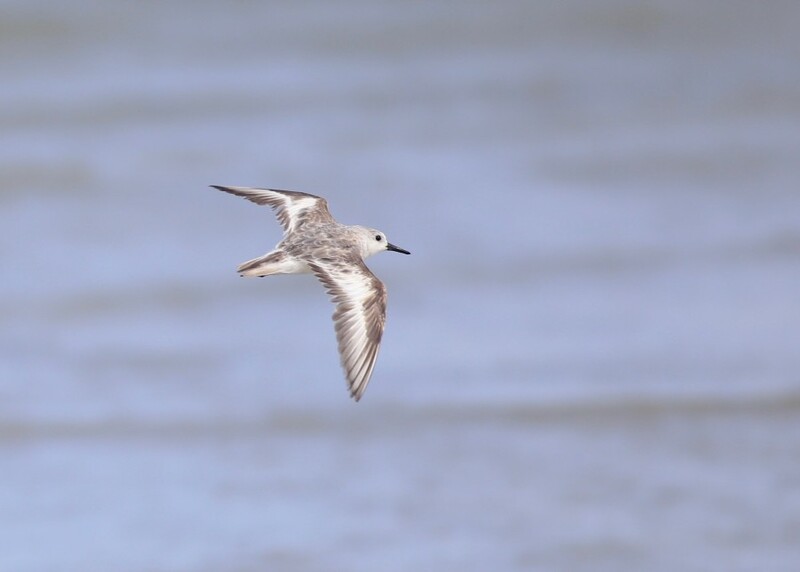 Meanwhile, birds such as Eastern Willet (Tringa semipalmata semipalmata), Wilson’s Plover (Charadrius wilsonia) and Gull-billed Tern (Gelochelidon nilotica) have stout bills, specialized for feeding on actively foraging fiddler crabs. The Brazilian coast is home to a substantial population of Wilson’s Plovers (Charadrius wilsonia), likely augmented by wintering birds from the north. 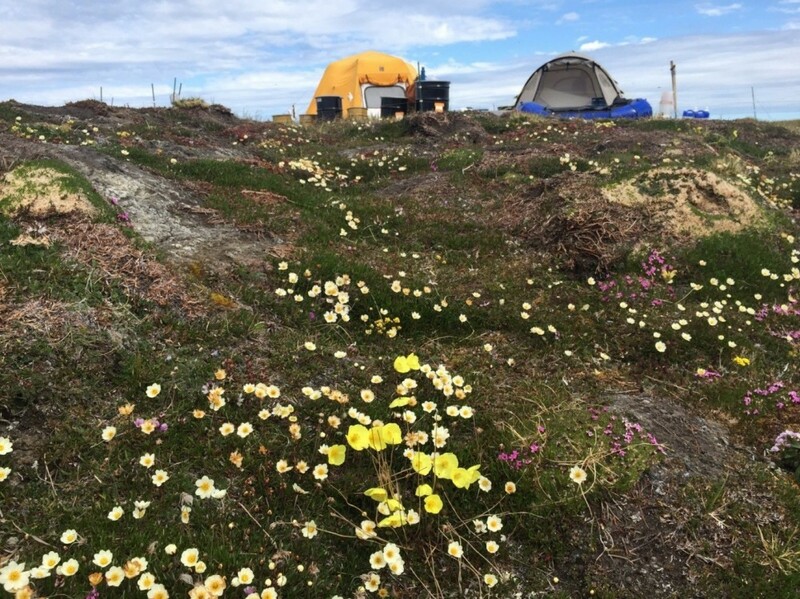 At one of our field sites, we found a flock of 50+ in the dry dune ridges. 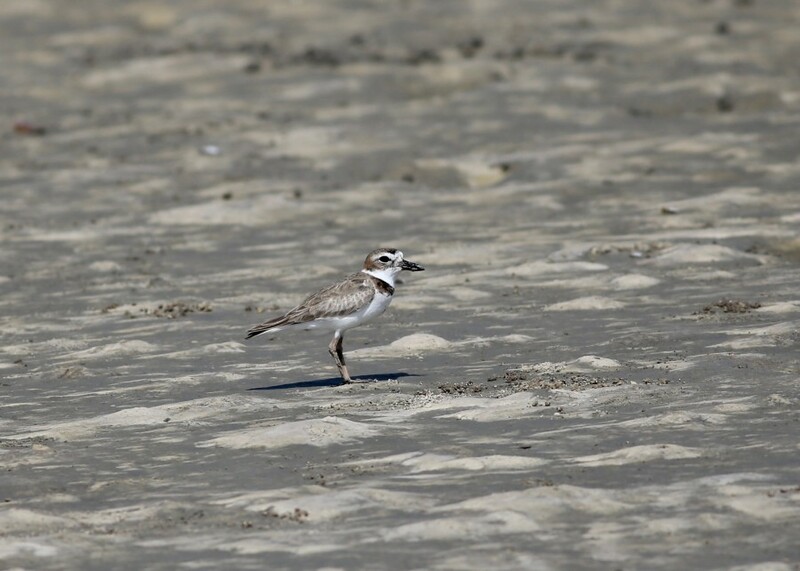 Among the Wilson’s were lesser numbers of Collared Plover (Charadrius collaris) and Semipalmated Plover (Charadrius semipalmatus). 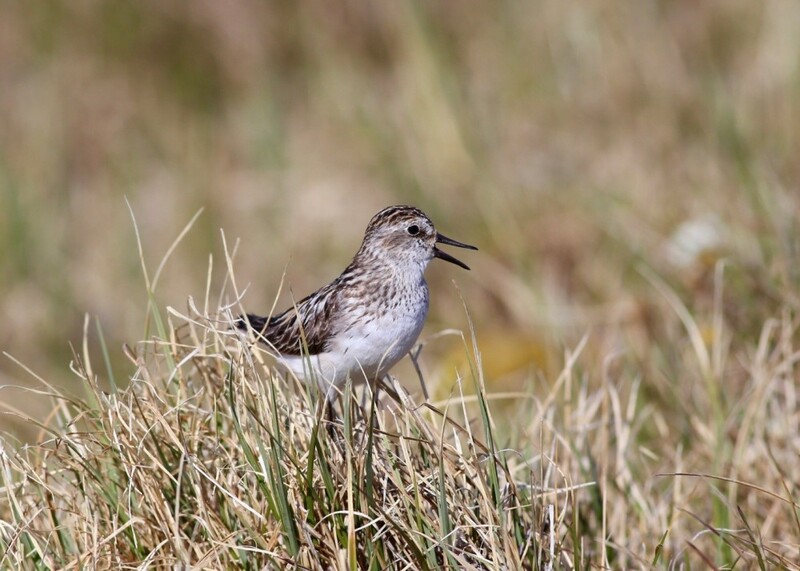 Many shorebirds molt their feathers while on their wintering grounds, a process that is energetically demanding. This Sanderling (Calidris alba) is replacing its greater coverts, revealing the vivid white base to the secondary feathers. According to estimates, the Brazilian coast is home to up to 44% of the South American population of (Hudsonian) Whimbrel (Numenius phaeopus hudsonicus). 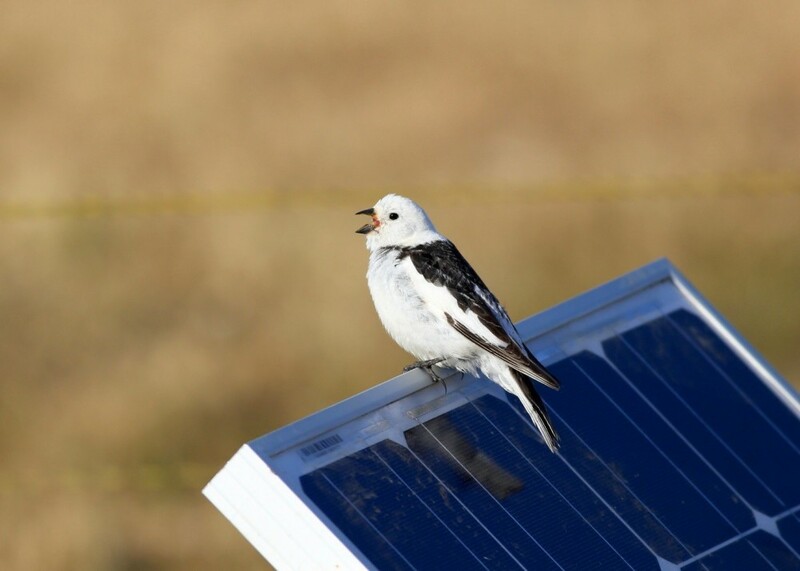 This number includes adult birds that spend the winter months here before returning to North America to breed, as well as juvenile birds that can stay for over a full calendar year. 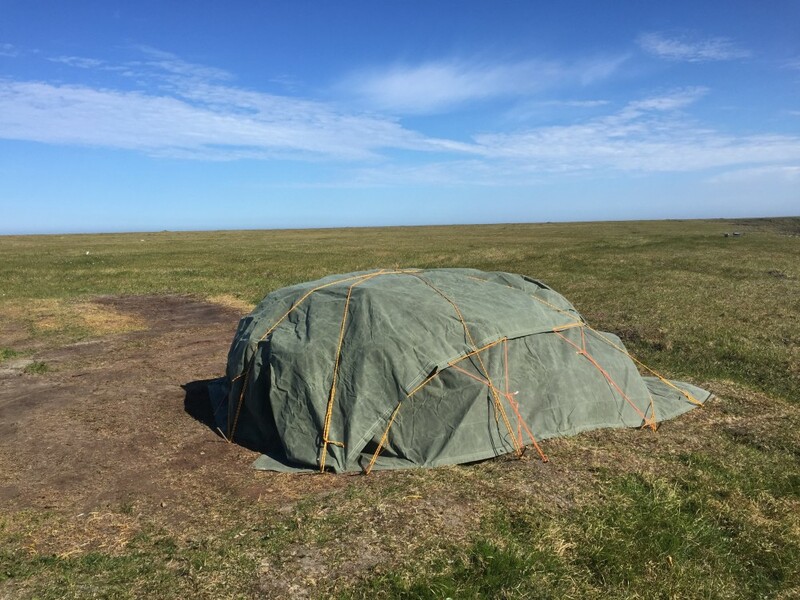 To better understand the migration ecology of this declining subspecies, shorebird researchers in the Atlantic Flyway (Center for Conservation Biology, Georgia DNR, Manomet) have been tagging Whimbrel with satellite transmitters over the past several years. 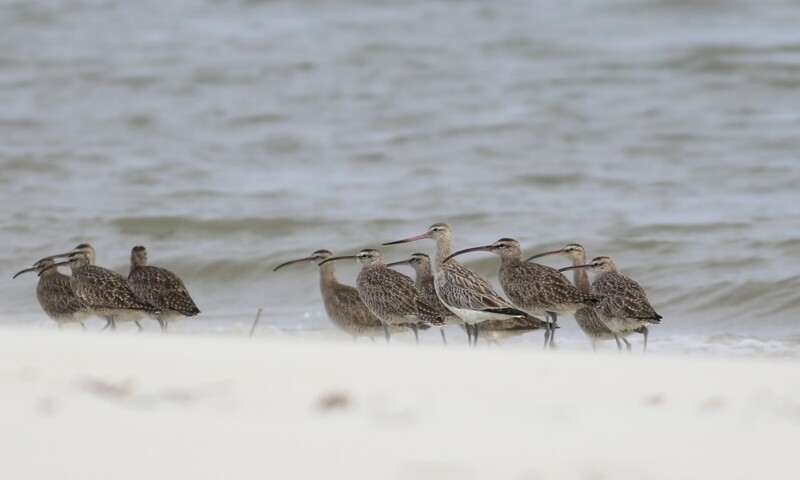 Many of these birds have spent the non-breeding season along this portion of the Brazilian coastline, including Ahanu, a Whimbrel tagged by Manomet staff on Cape Cod in the fall of 2018. 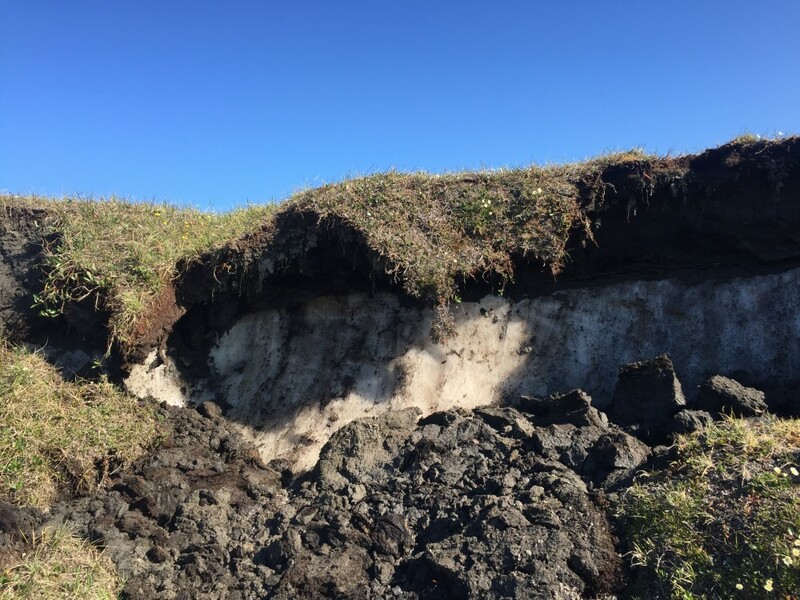 Ahanu continues to winter on the outskirts of São Luis, Brazil. Poaching is one of the greatest problems facing shorebird conservation in Brazil. 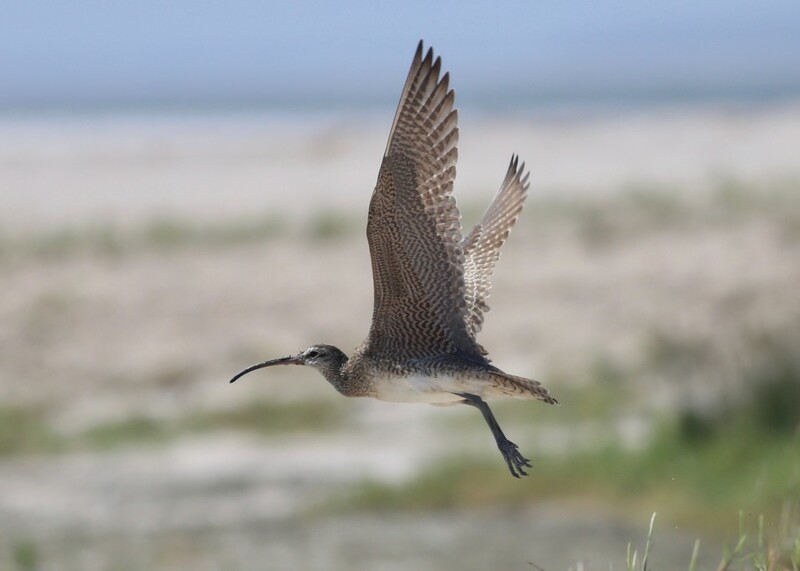 In the Brazilian state of Ceará, the Whimbrel (Numenius phaeopus) is called “Pirão Gordo.” “Pirão” is a mixture of fat and flour used to make a thick gravy, and “gordo” means fat in Portuguese, referring to the Whimbrel’s size. 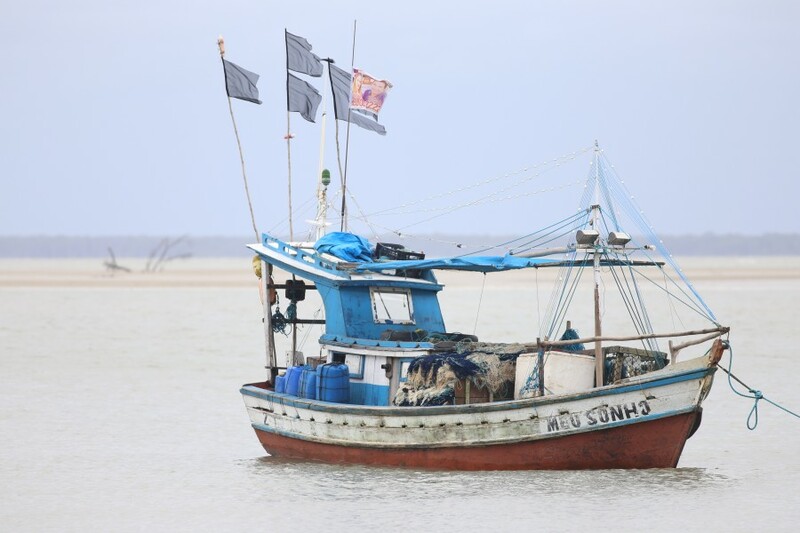 While the hunting of shorebirds is illegal in Brazil, enforcement is a challenge. As is the case for most birds that rely on the intertidal zone for foraging, high tide is a time for roosting. Whether a tern, skimmer, shorebird, or heron, the sand spit outside of the small village we stayed in was the place to be at high tide. Here, a flock of over 200 Whimbrel (Numenius phaeopus) rest. A flock of Semipalmated Sandpipers (Calidris pusilla) and Short-billed Dowitchers (Limnodromus griseus) wheel about as they settle into their high-tide roost. 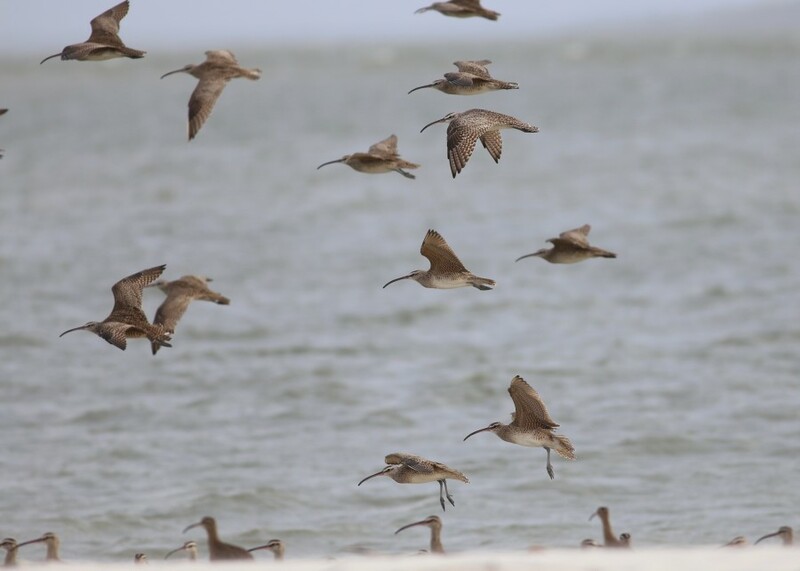 Among the regular suspects in Pará, we also spotted a few (European) Bar-tailed Godwits (Limosa lapponica lapponica). Recent explorations to this stretch of coastline have begun to reveal a pattern of regular occurrence for this species in Brazil. 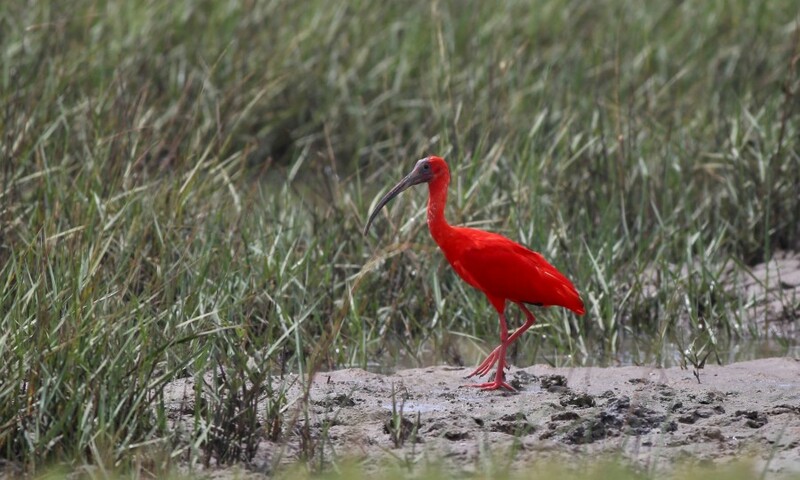 Without a doubt, the bird most emblematic of this region is the Scarlet Ibis (Eudocimus ruber). We regularly saw ibis feeding on the tidal mudflats and flying to and from their roosts at dusk and dawn. In Portuguese, the ibis is known as Guará, a word originating from the indigenous Tupi people. 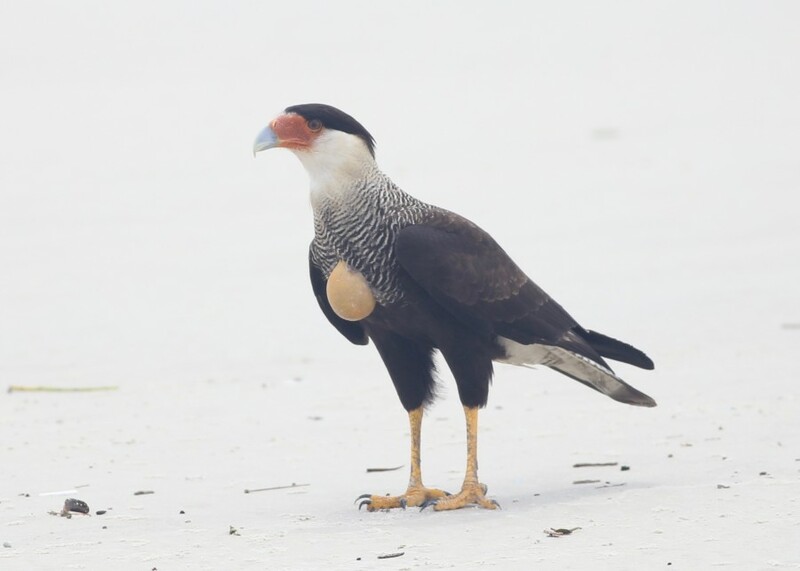 This Southern Caracara (Caracara plancus) has just finished gorging on a washed-up carcass. The crop, bulging out through the breast feathers, is used to temporarily store food prior to digestion. Being able to store food like this is all the more important when competing with the local Turkey Vultures (Cathartes aura) and Black Vultures (Coragyps atratus). 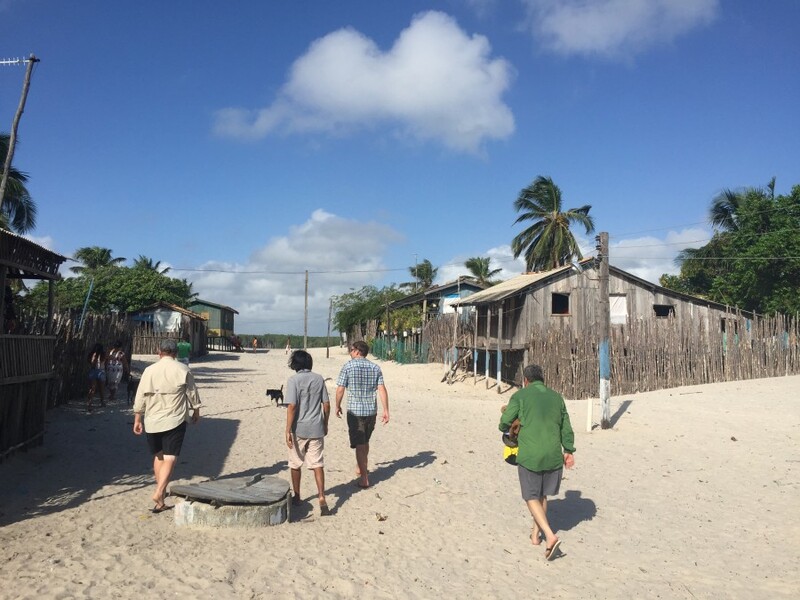 The team walks down the main street of Apeu, in Pará. From left to right: Bracken Brown, Onofre Montiero, John Herbert, and David Mizrahi. The trip to this village required a full day of driving on dirt roads followed by an overnight journey by boat.